Is Water a Nutrient? How Much Water Should You Drink a Day? Water is essential to life. 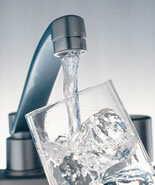 Water regulates body temperature and removes toxins from your body. It breaks down the food and dissolves amino acids, glucose and minerals. Remember that almost 60% of your body, and 70% of your muscle tissue is made up of water. The amount of water you need differs from person to person. It depends on various factors such as the type of activity you take part in, weather conditions, how much you weigh and how tall you are. Remember to drink extra water when you exercise, so your body doesn’t dehydrate. There is no simple answer on how much water you should drink per day, but a well known advice for an average person is to drink around 8 glasses of water every day. This advice is not far from the recommendations by the Institute of Medicine, where an adequate intake (AI) for men is roughly 3 liters (about 13 cups), and AI for women is 2.2 liters (about 9 cups) of total beverages a day. Remember that all fluids count toward the daily total. Also, some foods like fruits and vegetables contain a lot of water. Food usually contains more than half the water we need. Fruit is a great water source since it contains around 80 % of water. If you feel thirsty it will take around 20 minutes for the liquid to be utilized by the body. This is why it is so important not to wait until you feel thirsty. Water is the best quencher and meal drink. Remember that unlike soft drinks, juice and alcohol, water contains no calories .